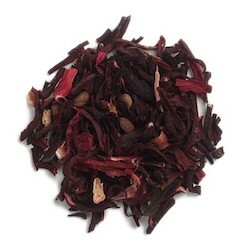 Organic Hibiscus Flowers are sourced in Burkina Faso in West Africa. These dried flowers have a deep red, magenta color and appear coarse and broken. Hibiscus flowers are commonly used as an herbal tea, especially in Caribbean and Latin American countries. They are often combined with other herbs or fruit juices and they impart a fruity, flowery and tart flavor. Directions: To use as a tea, pour 1 cup boiling water over 1 teaspoon herb, cover and steep 3 to 5 minutes.